As a school administrator, I’m often asked to sit in on a meeting between the teachers and parents of a student who is being unsuccessful in school. Teachers take turn talking about how the student is not doing homework or is being disruptive in class. Then, the parents give their child a lecture on how he/she needs to take school more seriously. Sometimes a teacher will add to the lecture, describing a personal story or some kind of heart-felt plea for the child to consider his/her actions and the effects they will have on the future. Then the parents request more communication from the teachers, even going as far as to asking them to notify them daily if the student doesn’t do his/her homework. This, of course, is not reasonable. Teachers don’t have the time to contact each student’s parents individually to let them know about homework. The meeting ends with the parents promising to do their best to hold the student accountable for his/her homework and the teachers promising to communicate more via email. After about a week, however, the student is back to his/her old habits, and eventually ends the year with poor grades. What I’ve found is that most parents want to help their child succeed, and they are willing to force them to do their homework or study for their test if necessary. Especially in grades six, seven, eight and nine, it’s important that the parents buckle down on the student. These are the years, in my experience, when many students will place their education on the bottom of their priority list. The problem is that the parents don’t know what the homework is. They have to rely on the student to tell them if there is homework or not, and the student may not want to divulge such information, especially if homework interferes with skateboarding or video games. Some teachers have tried to solve this problem by having a website where they post their homework online. This is a great idea, but unfortunately, teachers get busy, and find it difficult to consistently update their web page. Eventually, their website gets abandoned. It’s called a Homework Blog. But not just any homework blog, it’s a homework blog that’s not updated by the teacher, but rather by students. 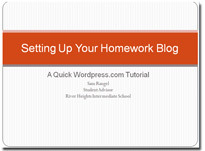 When I was a teacher, I created a homework blog for my team, and it was a great success. Parents could check every night what their child had for homework in each of their classes, and I didn’t have to do a thing, except set it up and select the students who were going to update the blog. I set up the first homework page. I gave two responsible students the login and password to the blog and showed them how to add a new post. The students then went to each teacher on the team and copied down the homework for the day that was written on the white board. The students then updated the blog on a daily basis. All I had to do was give the parents the web address to the blog, and that’s it. Teachers are happy; parents are happy; students are not too thrilled about it. Below, I’ve added a link to a video I created for my other blog, SuccessInTheClassroom.com, along with a PDF How-To sheet that I passed out to my current staff. This is one of the most successful projects that I’ve come up with. It’s a free and easy way to keep parents involved in the education of their children. 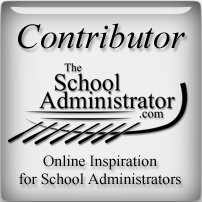 I would encourage any administrator who is reading this to share this post with their staff and any other administrator who is looking for a way to involve parents in a more immediate way. Most parents want to help. They are willing to do their part at home. They just don’t know what the student should be doing. This student-run homework blog gives the parents what they need to help their child be successful. I worked great for me as a teacher, and I am confident that your teachers will also see it as a valuable tool to get parents more involved and get more students finding success. Here's the PDF file that I gave to teachers at my current school.